I want to draw particular attention to the ongoing plight of Aboriginal and Torres Strait Islander children, as described in the RoGS data. To help set the overall scene, according to RoGS 2018, between FY10 and FY17 the number of children in out-of-home care in Australia increased by 32% from 35,895 to 47,915 and child abuse substantiations rose by 58% from 31,295 to 49,315. Total recurrent expenditure on family support services, intensive family support services, protective intervention services and out‑of‑home care services was $5.2 billion nationally in FY17 (a real increase of 8.5% from FY16), of which out‑of‑home care services accounted for 60%, or $3.1 billion. Tragically, the recent RoGS data indicates that the position continues to worsen for Aboriginal and Torres Strait Islander children. Let’s look at a few examples. 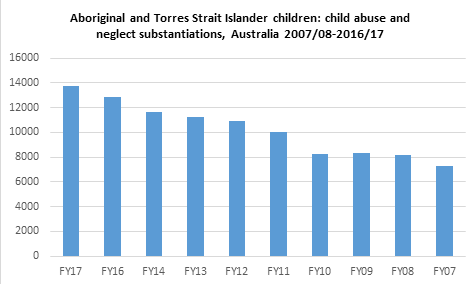 RoGS 2018 shows the unabated upward trend over the past 10 years in the number of substantiations of abuse or neglect for Aboriginal and Torres Strait Islander children aged 0-17 years. In FY08, there were 7,313 substantiations compared with 13,749 last year. 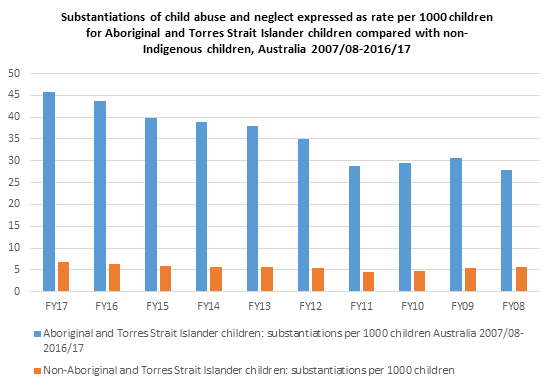 During the same period, the rate per 1000 children rose from 27.9 to 45.7 (it is noteworthy that the rate of substantiation per 1000 children for non-Aboriginal and Torres Strait Islander children rose only slightly, but still alarmingly, from 5.6 to 6.7). The following figures are drawn from RoGS 2018. The Aboriginal and Torres Strait Islander child placement principle puts priority on the placement of children who need care with Aboriginal or Torres Strait Islander relatives or extended family members, or other relatives or extended family members, or placement with Aboriginal and Torres Strait Islander family‑based carers. 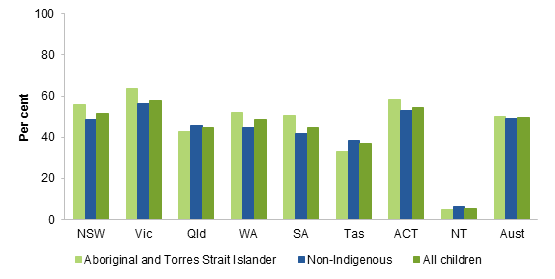 Yet, the proportion of Aboriginal and Torres Strait Islander children placed with kin has fallen. At 30 June 2017, the proportion of Aboriginal and Torres Strait Islander children so placed was 50.1%, or 4.7% lower than a decade ago. This week’s 10th anniversary of the National Apology to the Stolen Generations has again cast into strong relief the plight of many Aboriginal and Torres Strait Islander children. The figures cited in this year’s RoGS makes depressing reading, once again. Concerted national responses, such as the National Framework for Protecting Australia’s Children 2009-2020, which seek to prioritise issues facing Aboriginal and Torres Strait Islander children and families, are more important than ever. Particularly through the next iteration of ‘Closing the Gap’, we must step-up our efforts to achieve major shifts in systems, attitudes, policies and programs to stop the tragedy and the intergenerational trauma once and for all.